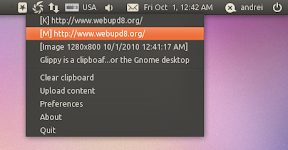 Glippy is a clipboard manager for the Gnome desktop. Some of its main features are: Ubuntu appindicator support, it can store test from both keyboard and mouse (select some text using your mouse and it will be available in Glippy), you can easily access the keboard using a hotkey (CTRL + SUPER + C by default, but it can be customized). A while back, Glippy got an option to upload the stored text to PasteBin and Image clips to Imgur. But back then, it only worked for special GTK image clipboard, used for example in GIMP or when selecting part of image or "Copy image" in Firefox/Opera. But starting today, this was further improved and you can now copy any image from your computer and select "Copy" (in Nautilus for example) and you'll then be able to upload it to Imgur via Glippy. For another great Linux clipboard manager, check out Pastie (it has any file type copy history support).